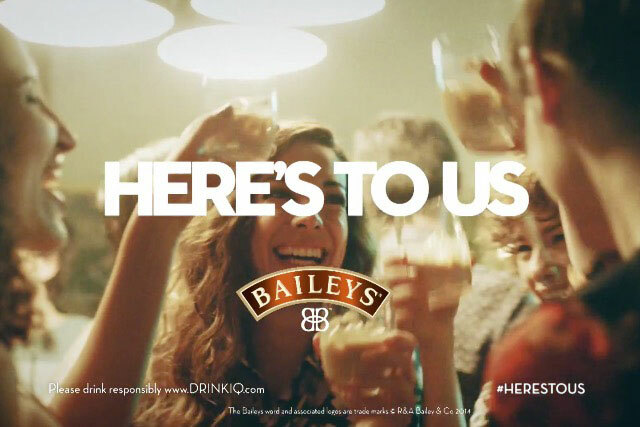 Diageo is attempting to persuade millennials to drink Bailey's in bars and clubs with a global ad campaign featuring groups of young women coming together for nights out, under the banner "here's to us". The ad, which goes live this week and was created by BBH London, is part of Diageo’s strategy to persuade women to drink Bailey’s in on-trade venues, as the drink is typically an impulse buy in supermarkets. The ad depicts various groups of young women travelling across cities including London to meet up for a celebratory night out, with Baileys starring as their favoured tipple. In keeping with the female target market and the theme of the ad, the work has been created by an all-woman agency team and largely female production team. The soundtrack is We Got The Beat by The Go Go’s, an all-female American rock band. The TV ad will be supported by print advertising carrying various serving suggestions, such as Baileys shaken over ice, or served in a shot glass. The 60-second spot is the first in a series of ads that will celebrate female friendships, with groups of friends from around the world going out on girls’ nights. The global campaign is breaking in the UK, Western Europe and the US, before rolling out in other markets. Ros Healy, Diageo’s global content creations director, said: "This campaign marks the next phase in our exciting journey to re-ignite the true essence of the Baileys brand by celebrating the brilliant spirit of women. "We wanted to shine a light on the insight that women bring out the brilliance in each other and hope that this TVC expresses that particular magic you feel when you’re with your best girlfriends, inviting women around the world to raise a toast with Baileys."